Jennifer Aniston is one of the most popular women in Hollywood. It’s hardly surprising therefore that half of the film industry seemed to turn up to her 50th birthday party this weekend. In fact, it’s hard to think of an A-lister that wasn’t in attendance. The party that took place at LA’s Sunset Tower Hotel on Saturday is said to have seen a star-studded guest list, from Courtney Cox, Lisa Kudrow, Gwyneth Paltrow, George and Amal Clooney and Reese Witherspoon, to Kate Hudson, Ellen DeGeneres, Barbra Streisand, Laura Dern, Demi Moore, Orlando Bloom and Katy Perry. Love these ladies Celebrated this beauty last night Happy Bday JA! We all love you sooo! Yes – everyone was there, even a couple of Jen’s exes. According to PEOPLE, Jen’s ex John Mayer was in attendance, but it wasn’t the ‘Free Fallin’ singer’s attendance that made the most news. Instead it was the presence of Jen’s ex husband, Brad Pitt. Yes. This is not a drill. Brad Pitt attended Jennifer Aniston’s 50th birthday party – and everyone’s confused. The former couple, who split in 2005 after five years of marriage, have recently split from both of their spouses, Angelina Jolie and Justin Theroux. Brad’s attendance at this ex-wife’s birthday bash therefore added fuel to rumours of a romantic reunion. Sources close to the couple however have apparently rubbished the rumours, with one telling E! News, ‘Someone extended the invitation to Brad to come to Jen’s party and he accepted. Move over Chris and Gwyneth – these two are ex goals. 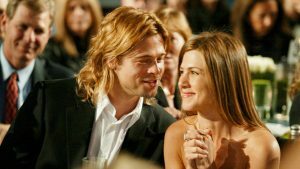 The post Brad Pitt was at Jennifer Aniston’s 50th birthday and everyone’s confused appeared first on Marie Claire.